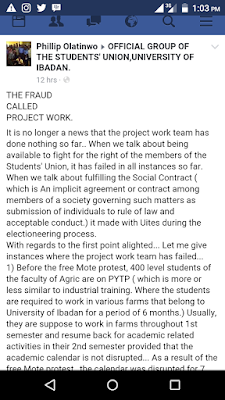 Official Students' Union Page Of The University Of Ibadan is on fire after a Student named Philip Olatinwo shared a post on the group page titled "The Fraud Called Project Work". 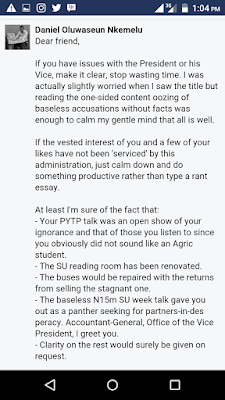 Students of The University have responded to the post in both postive and negative ways causing a serious drama on the UISU Group Page. 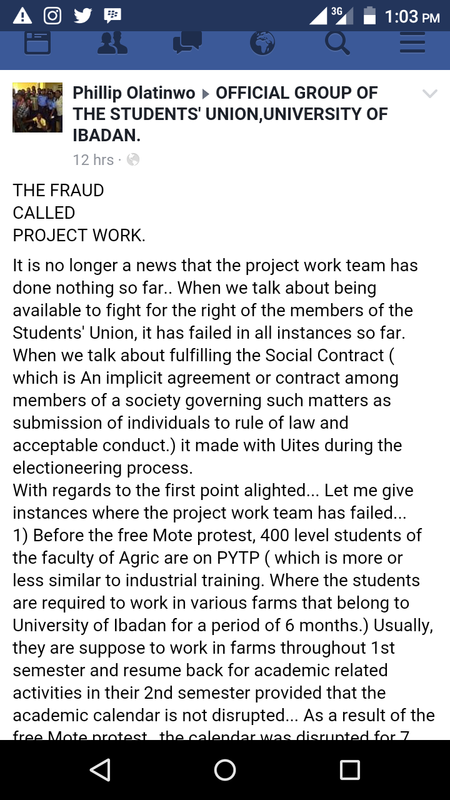 THE FRAUD CALLED PROJECT WORK. 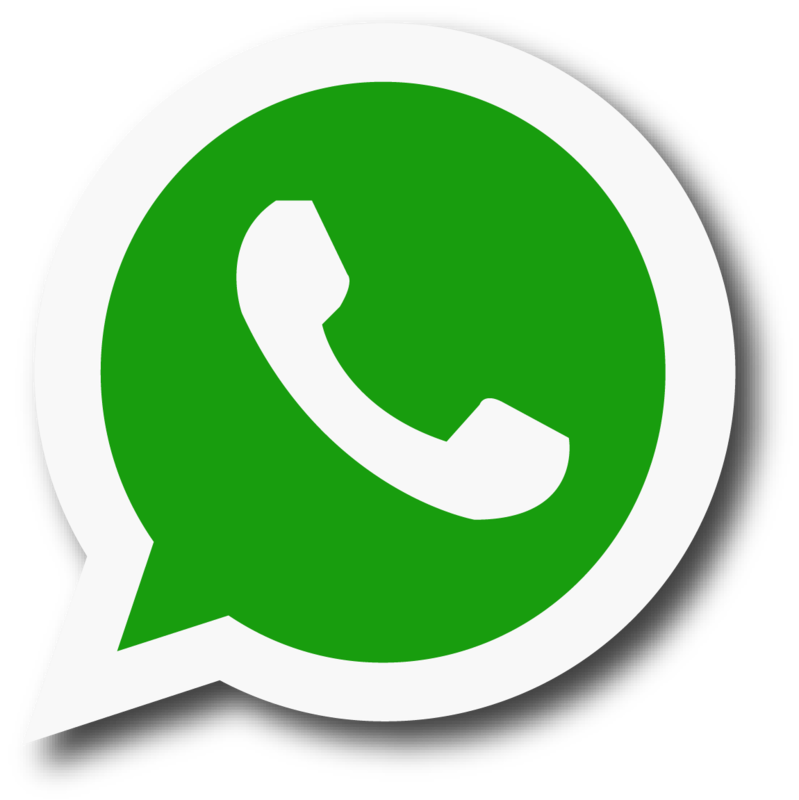 It is no longer a news that the project work team has done nothing so far.. When we talk about being available to fight for the right of the members of the Students' Union, it has failed in all instances so far. When we talk about fulfilling the Social Contract ( which is An implicit agreement or contract among members of a society governing such matters as submission of individuals to rule of law and acceptable conduct.) 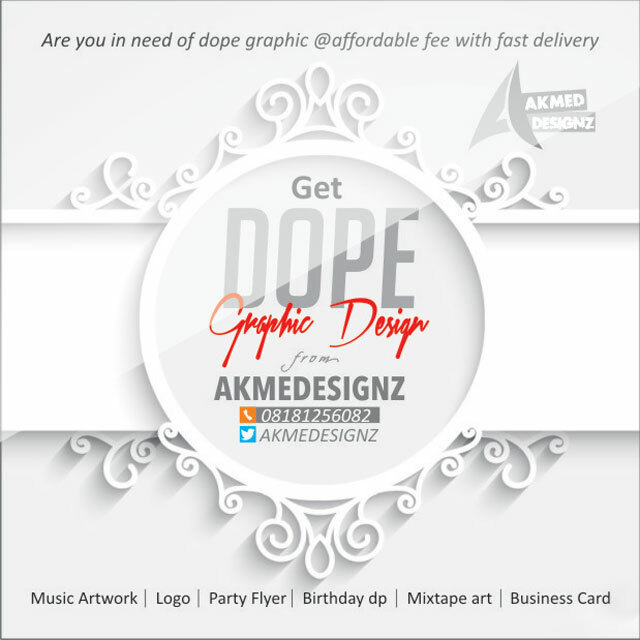 it made with Uites during the electioneering process. 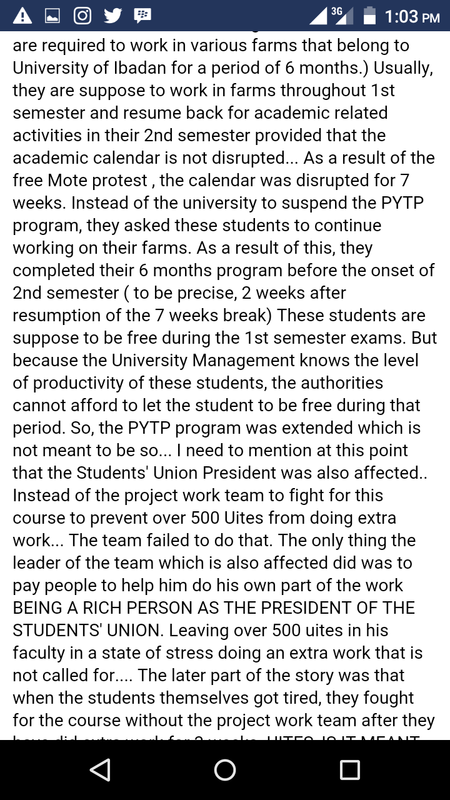 1) Before the free Mote protest, 400 level students of the faculty of Agric are on PYTP ( which is more or less similar to industrial training. Where the students are required to work in various farms that belong to University of Ibadan for a period of 6 months.) Usually, they are suppose to work in farms throughout 1st semester and resume back for academic related activities in their 2nd semester provided that the academic calendar is not disrupted. 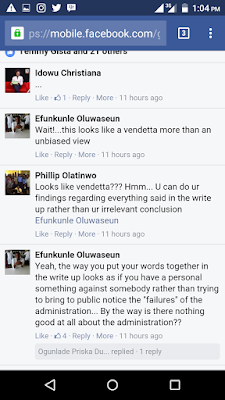 I need to mention at this point that the Students' Union President was also affected.. 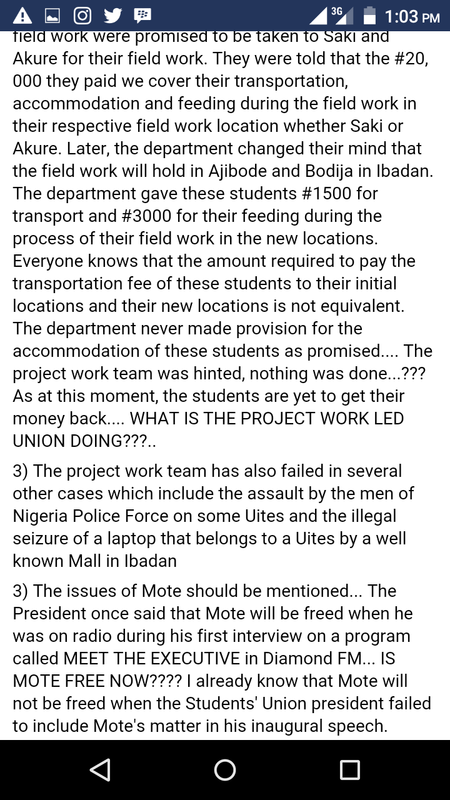 Instead of the project work team to fight for this course to prevent over 500 Uites from doing extra work... The team failed to do that. 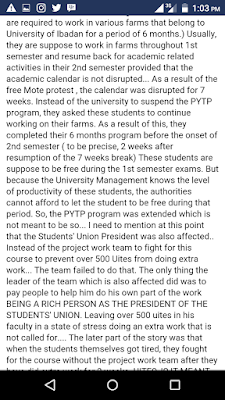 The only thing the leader of the team which is also affected did was to pay people to help him do his own part of the work BEING A RICH PERSON AS THE PRESIDENT OF THE STUDENTS' UNION. Leaving over 500 uites in his faculty in a state of stress doing an extra work that is not called for. 2) #20,000 FIELD WORK SAGA IN ARCHAEOLOGY AND ANTHROPOLOGY. The students that went for field work were promised to be taken to Saki and Akure for their field work. They were told that the #20, 000 they paid we cover their transportation, accommodation and feeding during the field work in their respective field work location whether Saki or Akure. 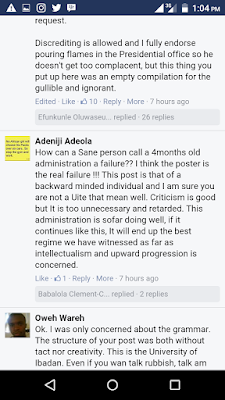 Later, the department changed their mind that the field work will hold in Ajibode and Bodija in Ibadan. The department gave these students #1500 for transport and #3000 for their feeding during the process of their field work in the new locations. Everyone knows that the amount required to pay the transportation fee of these students to their initial locations and their new locations is not equivalent. 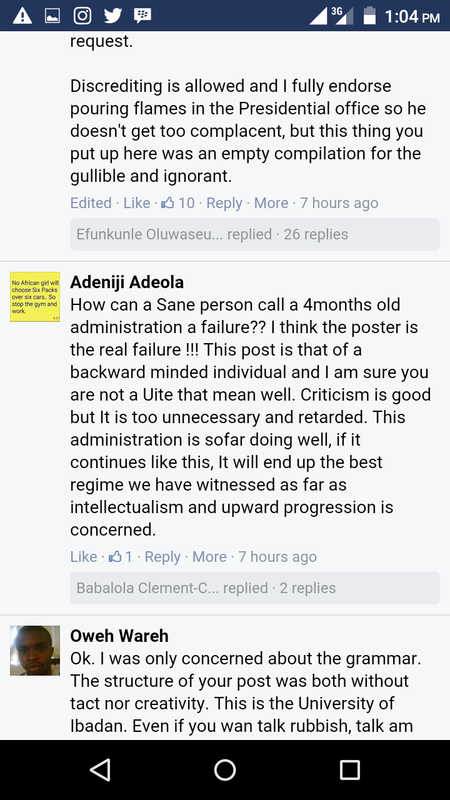 The department never made provision for the accommodation of these students as promised.... The project work team was hinted, nothing was done...??? 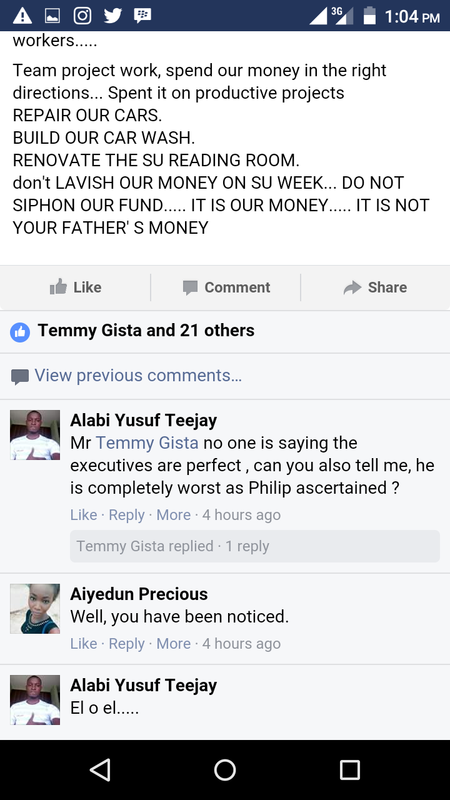 As at this moment, the students are yet to get their money back.... WHAT IS THE PROJECT WORK LED UNION DOING???.. 3) The issues of Mote should be mentioned... The President once said that Mote will be freed when he was on radio during his first interview on a program called MEET THE EXECUTIVE in Diamond FM... IS MOTE FREE NOW???? I already know that Mote will not be freed when the Students' Union president failed to include Mote's matter in his inaugural speech. 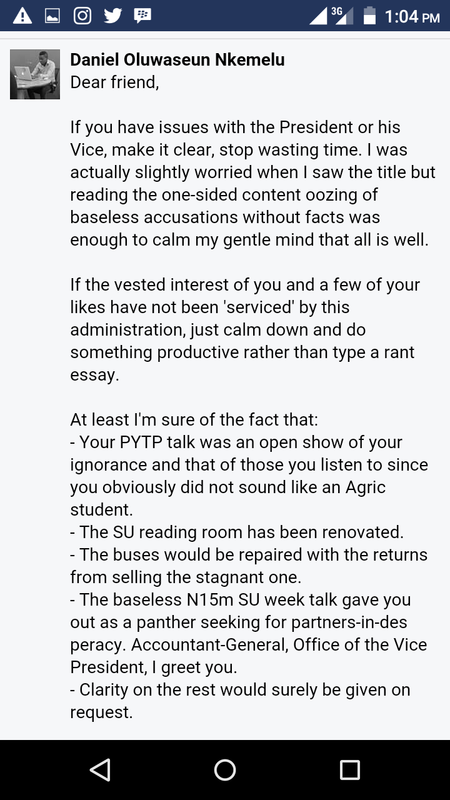 4)The Students' Union President has some few questions to answer regarding the just concluded NANS Convention in Abuja where some Uites were assaulted and sent down from the Students' Union Bus by some Hoodlums that claimed to be students of Special College of Education, Oyo that were led by NANS Oyo State Chapter Chairman. 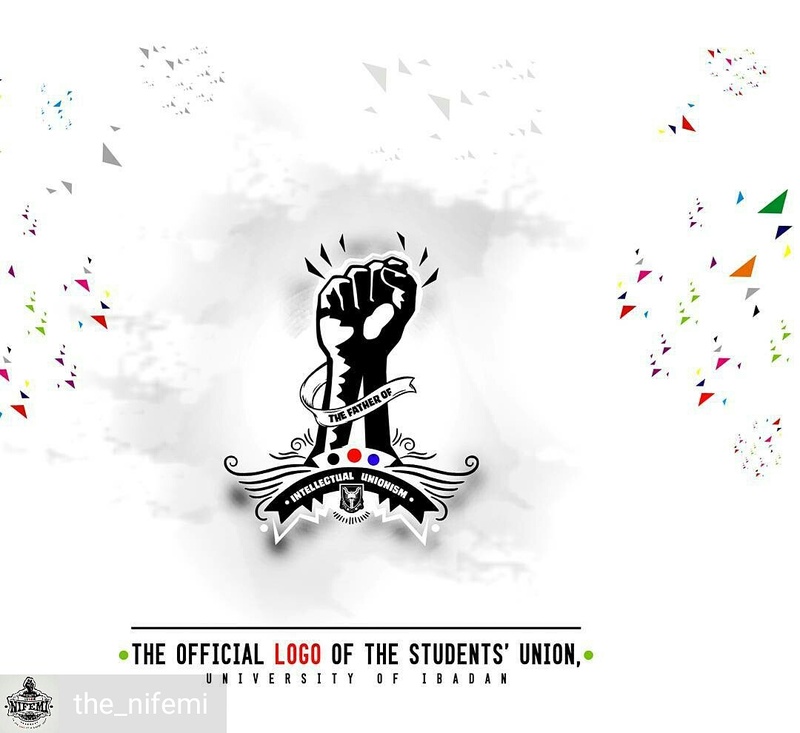 Let now go to the Social Contract the project work team made with Uites during the electioneering process. 1) The project work leader, Ojo Emmanuel Nifemi, said that he will repair all our buses. He said these buses will be used to generate funds. 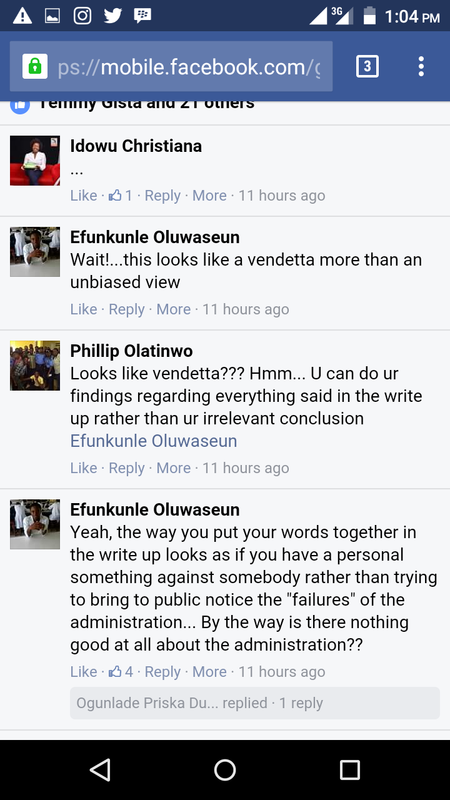 He said this at the press night that was held in Trenchard hall. He has not fulfilled this contract he made with us.... Only one of the 3 buses is working. 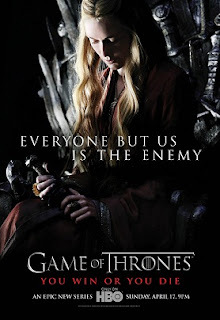 Even, the one that is working is not working well. He is also on the path to selling the Macopolo bus that he promised to repair. 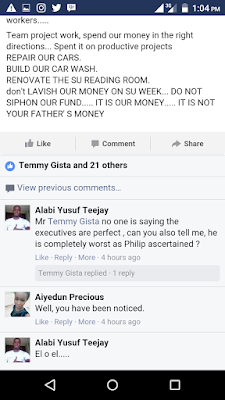 I think Uites need to ask him to fulfill the contract he made with us. 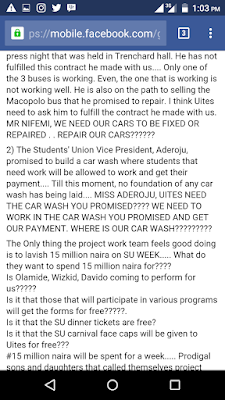 MR NIFEMI, WE NEED OUR CARS TO BE FIXED OR REPAIRED . . REPAIR OUR CARS?????? 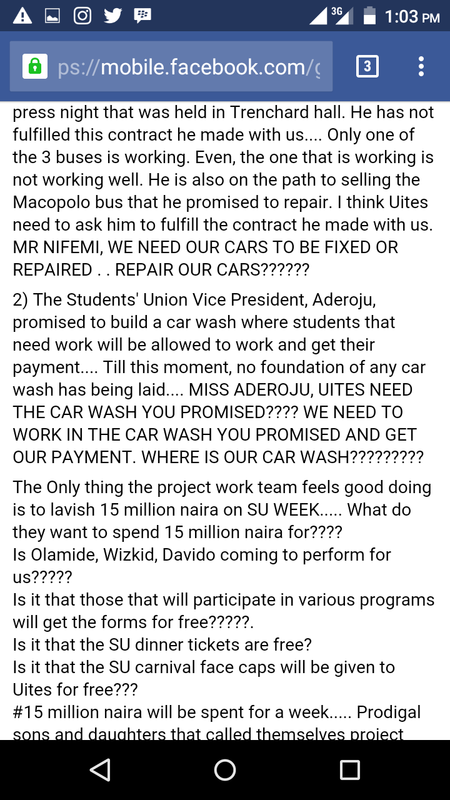 2) The Students' Union Vice President, Aderoju, promised to build a car wash where students that need work will be allowed to work and get their payment.... Till this moment, no foundation of any car wash has being laid.... MISS ADEROJU, UITES NEED THE CAR WASH YOU PROMISED???? WE NEED TO WORK IN THE CAR WASH YOU PROMISED AND GET OUR PAYMENT. WHERE IS OUR CAR WASH????????? 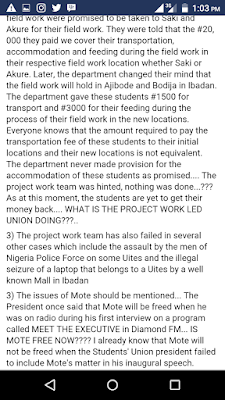 The Only thing the project work team feels good doing is to lavish 15 million naira on SU WEEK..... What do they want to spend 15 million naira for???? Is Olamide, Wizkid, Davido coming to perform for us????? 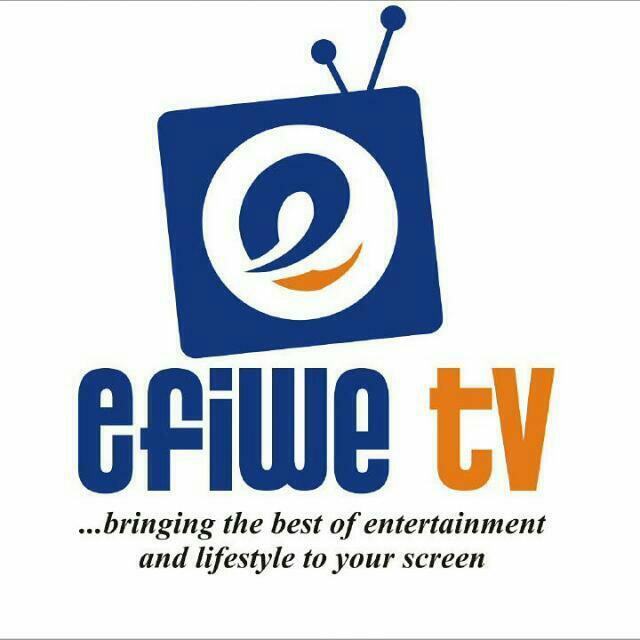 Is it that those that will participate in various programs will get the forms for free?????. Is it that the SU dinner tickets are free? Is it that the SU carnival face caps will be given to Uites for free??? RENOVATE THE SU READING ROOM.